ABB is supplying key technology for a Jamaica microgrid being designed to integrate solar and wind energy into the tropical island’s power supply. Jamaica Public Service (JPS) expects to have the $21.6 million microgrid operating in April 2019. The 24.5 MW project will include fly wheels and lithium ion batteries. ABB will provide microgrid and energy storage technology for the project. Heavily reliant on fossil fuels, JPS has begun building more renewable energy, about 160 MW, accounting for about one quarter of its generation capacity. ABB said that the Jamaica microgrid will make power available when solar and wind sources are interrupted due to cloud cover, reduced wind or other factors. The microgrid project comes on the heels of a record year for capital investment in Jamaica’s electricity service. The utility invested $102 million on capital projects to improve the electricity service across the island. Microgrids are increasingly looked upon as a cyber war protection tool, a way to keep electricity flowing to critical services, should hackers ever succeed in their attacks on the power grid. Now, Navigant Research is heightening the warning about cybersecurity in a new report that looks at the impact of Internet of Things (IoT) devices on the grid. IoTs – from smart meters to electric vehicles – offer possible portals for hackers. The report, “Managing IoT Cybersecurity Threats in the Energy Cloud Ecosystem,” examines the IoT cybersecurity threats that challenge utilities and other enterprises. The study also offers practical steps to significantly reduce risks from cyberattacks. An executive summary of the report is available for free download. Kokua Aina Energy Partners, a local Maui development team, has entered into an agreement with Texas-based project investment company Crescendo Power. The agreement will help support sustainability project development in Hawaii and the U.S. mainland. Kokua Aina is a Hawaii-based developer of renewable energy and microgrid projects. Crescendo Power is a project investment company that focuses on behind the meter distributed energy resource projects including microgrid systems. 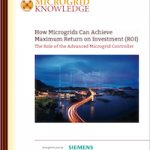 Track news about microgrids and energy storage by subscribing to the free Microgrid Knowledge newsletter.